Around the office, we love the song, The 12 Days of Christmas. Because five golden rings? That’s a gift we love! Here are five styles of rings, each feature gorgeous yellow gold. 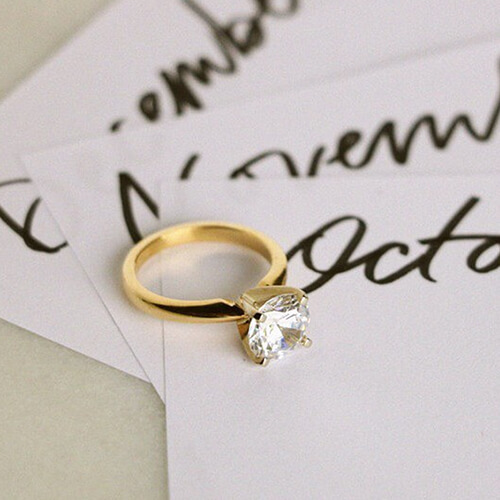 A yellow gold solitaire is just about as classic as you can get. 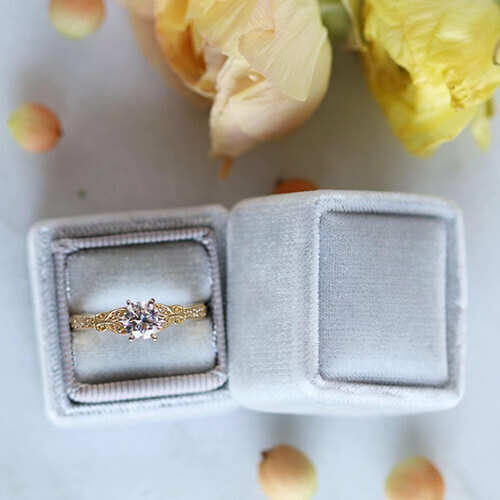 Pay attention to the prongs: Yellow gold stands out as a design element, while white gold prongs like those in our Tiffany-Style Solitaire will blend into the stone. 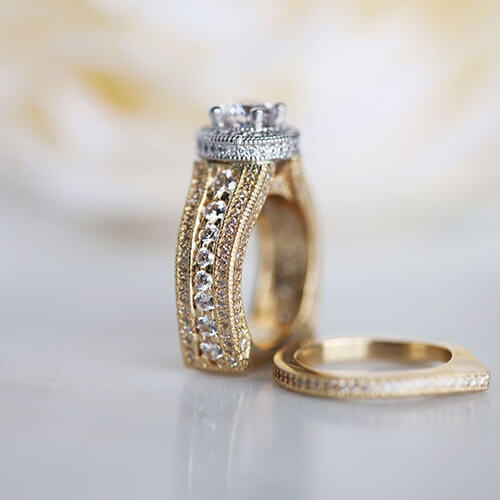 We love a yellow gold halo, because the warm tone of the gold defines the outline of each individual stone. 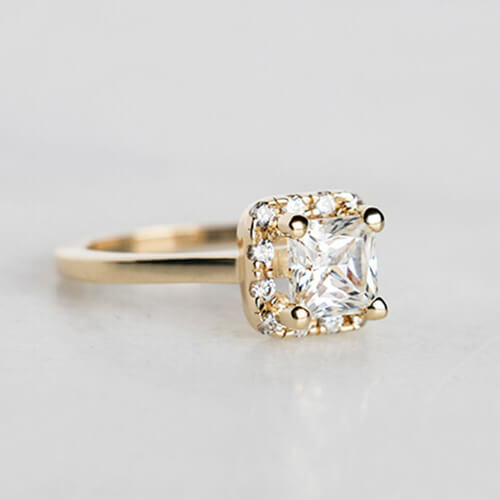 The amount of gold between each accent stone is a matter of preference; the Madrid Classic Princess Halo has four prongs per stone, creating more space between them. Even with closer-set accent stones, yellow gold highlights the intricacy of the setting, and strikes the right balance of trendy and traditional. When made in yellow gold, nature-inspired designs can feel even more luxurious and delicate. The leaf and vine motif in the French Quarter Ring recalls a piece of art or sculpture in the most gorgeous way possible. Want even more golden ring goodness? Customize your ring to have canary accent stones that will shimmer but blend in more with the yellow gold. On-trend but oh-so-classic. Big, intricate rings have even more presence in yellow gold. With all the detail and metalwork, rings like the Chelsa Round Cut can look even more stunning when you mix white gold into the design. Breaking up the color helps draw the eye around the ring and distributes visual impact to show off your ring in the best way. Who says yellow gold is only for engagement rings? Not us. 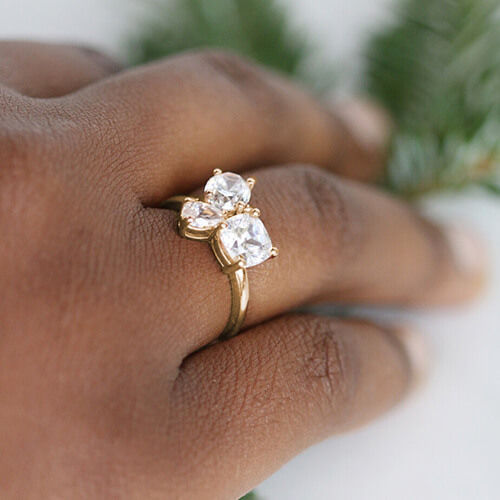 We love cluster styles like the Elara Ring in the warm gold tone, because the prongs create definition between each individual stone and showcases the different shapes. Wear it on any finger and flaunt it! Which style is your favorite? Would you choose yellow gold? Elara. Now this one is truly special and unique. I want one as a right-hand bling, er, ring! Beautiful, especially the first three plus the last one. There is a ring I love and I noticed that none of my purchases have come up on the rewards points. We bought the Abigail engagement ring and wedding band, we also bought the canary diamond engagement ring, 1+carats with the two triangular diamonds flanking the center stone! Aren’t those worth ANY reward points??? Iv also noticed the Abigail doesn’t hold up well...it’s missing a stone and is all scratched up!! Diamond Nexus response: Hi Jennifer! Thank you for reaching out. First, for your Abigail ring, please give our customer service team a call for help with repairs! Depending on when you purchased it, it may still be covered under your Everything's Covered Plan, and we can always help you replace and reset a missing stone. For your reward points, it does take some time for points to be approved in your account; however, if it has been quite a long time, give us a call so we can help you work that out - you should certainly get points for your purchases! I would choose Halo and then French Quarter. I always prefer yellow gold and then rose gold. I would choose the yellow gold Halo. To me it symbolizes one love surrounded by another. A unique design. Don't like the cluster ring but LOVE the others!